A warm welcome to all new comers of the Web Wednesday community, which has now reached 563 Asian digerati working in the internet and digital media space across Asia. I’d like to thank Ivy Wong, the elegant COO of TVB.com, for being our guest speaker at the last event. Unfortunately, our recording was mistakenly erased. In summary, Ivy admitted that TVB was dealing with the worrying trend of youngsters ditching TV for the web; she also felt that Hong Kong consumers expect web content for free (i.e. paid downloads or subscriptions won’t work); she challenged media buyers by suggesting that they look at truly integrated offerings across all media platforms; invited anyone with interesting technology offerings, including in-game advertising, to contact her; and finally, pronounced her ambitious goal to help Hong Kong’s housewives (“see lai” in local slang) enjoy TV online. Ivy gave away some great prizes, including 1 million banner impressions (worth HK$40,000!) to the lucky winner Angus Lau of EditGrid, Hong Kong’s home-grown online spreadsheet provider. If you missed the event, you can check out the photos on our Web Wednesday Group on Flickr. Our next event, Social Mixer V12.0, will start at 6pm on Wednesday 7th May 2008. If you’re on Facebook (524,697 people just in Hong Kong! ), you’re welcome to sign up for the event here. To date, we have over 106 attendees confirmed. As the Internet has become a battle ground for the Beijing Olympics, both within and outside China, we felt it was important to bring this topic to our community here in Hong Kong. We have therefore invited two speakers who track this furore on a daily basis and have the journalistic experience to give us measured insight into recent developments. Ms. Oiwan Lam, North East Asia Editor for Global Voices, a non-profit global citizens’ media project founded at Harvard Law School, and editor of Hong Kong InMedia, a Chinese citizen journalism site. Mr. Thomas Crampton, ex-correspondent for the International Herald Tribune and the New York Times. He was based in Asia for ten years before leaving for postings in the US and Europe. He recently returned to work on the business side of media with Next Media. Naturally, Thomas is a prominent and incisive blogger. 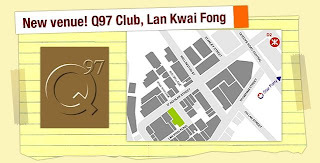 Due to the ever-growing crowd of Asian digerati, we've outgrown our generous hosts at Lotus and will be moving our social mixer events to the newly launched Q97 in the basement of California Tower in Lan Kwai Fong, Central, Hong Kong. If you’re into club music, do join the Q97 Group on Facebook. To enjoy a complimentary welcome drink, simply download the Q97 wallpaper from our mobile website (m.webwednesday.hk) and show it to the door staff. This is sure to be an enlightening event so so please do come along with friends to mix, contribute and share you hotly-contested opinions. If you wish to join our bustling community, either send me an email or sign up for the Web Wednesday Group on Facebook. Feel free to “share the love” and invite others along. The event is free and open to all curious minds! Looking forward to seeing old faces and meeting many new ones! It goes without saying that we at the EditGrid Team are proud of Angus' scoop :) It's worthwhile to point out, though, that Angus has earned his bragging right no less because of his hard work at 852signal, the authoritative Web 2.0 blog from Hongkong. Keep up the good work!